On this Memorial Day, here is an essay Don wrote several years ago as a tribute to an uncle he never met but for whom he was named. His mother's older brother, Donald Sowers, died in World War II. I don't know how he died, really. No one does, since everyone who was with him died at more or less the same time. I'll bet he was afraid. I would have been. It must have been hell on earth – above earth to be exact. A booming, banging, grinding, shaking, shattering horror. Especially it must have been tough on him, hanging as he was below the belly of a crippled plane, a bubble of glass exposed to the flak and the fire from enemy aircraft. A tasty and too-visible target. His B-24 Liberator was powerful, true. But it was also lightly armored and easily damaged in combat. When damaged, the B-24 often lost the electrical power needed to rotate its gun turrets, and the gunners would have to hand-crank their turrets around, trying to follow the enemy planes. He was probably the youngest man on board. He was certainly the lowest-ranking member of the ten men who made up the crew. That first day of August in 1943, he'd only been in the Army Air Corp for a year and a half. He'd only been overseas for six months. He was 19 years old. He came from a farming family that lived in a very small town in Kansas. He had one sister, two brothers, and two very worried parents. He was assigned to 98BG, a bomber group stationed out of Benghazi, Libya. His mission that day? In coordination with 178 bombers and 1,700 crew members, the 98BG was to attack and destroy the oil refineries at Ploesti, Romania. These facilities provided the Third Reich with one-third of its fuel … and the Nazis were very hungry for fuel in the waning days of 1943. The oil refineries at Ploesti were protected with massive anti-aircraft batteries and hundreds of German and Romanian fighter planes. The distance traveled by the Allied bombers meant that no fighter protection could attend them. They were alone. It was a tremendous undertaking, a gamble of men and machines desperately needed for the war effort. A 2,400 mile, eighteen hour trip there and back again, with only a half-hour of available time over the target. And in the end, for over 500 airmen and 52 bombers, there was no going home. They say he's buried at a cemetery near Liege, Belgium. Maybe he is, maybe he isn't. 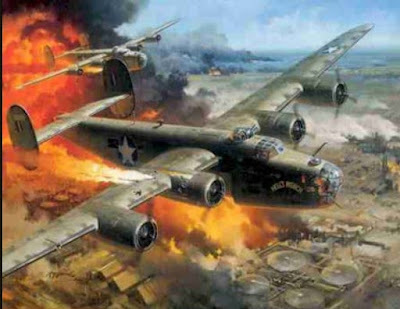 The records show that his B-24 was shot down over the refinery, but that it happened before the crew could disgorge the plane's 8000-pound payload of high explosives. And the B-24 Liberator was well known for burning merrily when it crashed. 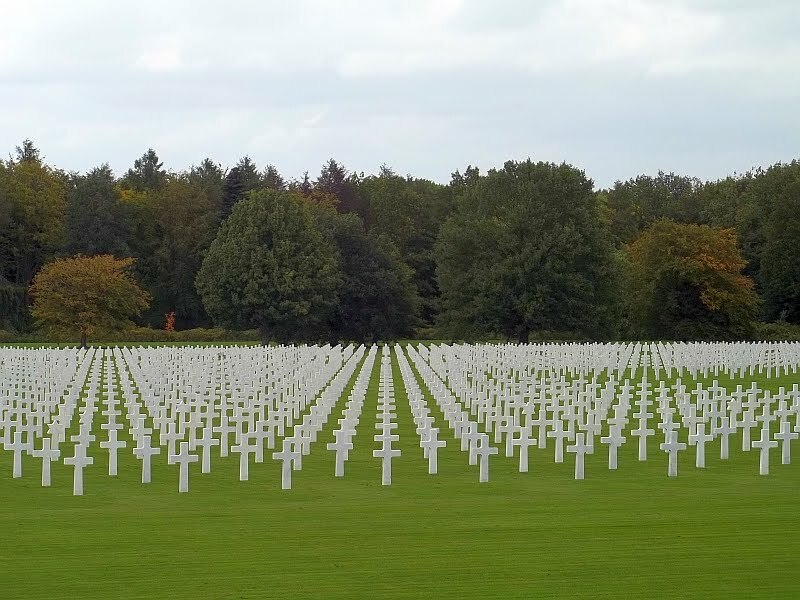 But his name is on one of the white crosses standing in formation at the lovingly well-tended cemetery. His parents back in Kansas received the medals that he was awarded posthumously at a ceremony, probably one of many such ceremonies on that same day. The medals were: a Distinguished Flying Cross, a Purple Heart, and the Air Medal with three oak leaf clusters. Both his brothers eventually went to war as well. One went as another tail gunner, the other as a pilot. His younger sister stayed home, grieving for the older brother she would never see again on this side. Eventually she married my father. The parents, the brothers, and the sister passed away some time ago. There is now no one who can tell me anything more about Donald Phillip Sowers – Sargent, United States Army Air Corp. The uncle I never knew and whose name I share. Donald Philip Sowers never woke to the face of his bride on the day after his wedding. He never paced the floor late at night singing softly to an infant daughter who just couldn't sleep. He never got to hold his child's hand the last time she needed, or wanted, help to cross a street. He never felt the aches and pains of a long life, well lived. And well loved. But I will remember him and so will my children. If you've taken the time to read this, tip a glass in his name and remember him. And all the other lost brothers and sisters as well. Think of the things he missed, for the things you have. 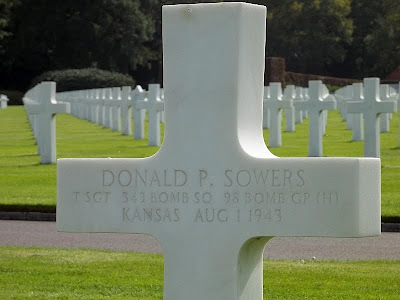 Donald Philip Sowers died fighting the greatest evil of our time – a young man of 19 who will never grow old. A few years after WND printed this column, a blog reader contacted us. 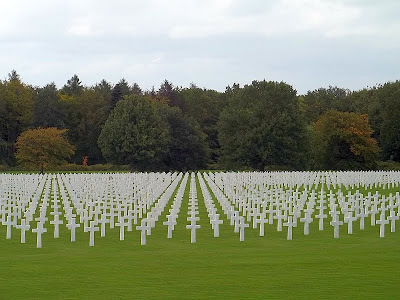 She had visited the Ardennes American Cemetery in Liege, Belgium, and found the grave of my husband’s uncle. She kindly sent us many photographs of the cemetery in general and his tomb marker in particular. They are moving beyond words. Too many people have no idea what Memorial Day really is. It’s become a day to welcome summer: a day for barbecues, for beer, for picnics, for an extra day off work. But that wasn’t the original intent. Memorial Day was meant to remember those who died preserving our freedom. Can we remember? Or will we now let those freedoms wither in our brave new world of social justice warriors too cowardly to face real threats? A safe and thoughtful Memorial Day to everyone. A society that loses its memory loses itself. That is why it is so important to remember the sacrifices of these heroes and to learn how to wisely fight evil so future wars are not our only option. Thank you for sharing. I had a second cousin that died two months after I was born in Vietnam. Thank you. And thank Don. Wonderfully written. God Bless America and all of our men and women that are serving and have served to allow us our freedoms. Please thank your daughter for me. Thank you and Don for raising such an amazing person. The Ploesti Raids were an amazing push. Winston Churchill said Ploesti was the 'tap root' of German oil. Godspeed Sgt Sowers! My Husband is named after his Uncle. He was 19 and serving as a Tail Gunner for the 722nd Bomber Squadron, 450th Bomber Group. The plane was damaged and going down. He continued providing covering fire for the men who were able to bail out before crashing. He is good company at Ardennes American Cemetery . Well written and very meaningful, so few of us remember, those brave young men and women, who served to help protect us from harm. Today, we are way to busy with all our electronic gadgets to take time to consider the loses, to protect our Democracy from all comers, both foreign and domestic. I served in Vietnam, where over 50,000 of our young folks died, basically for nothing. Blocked from victory, by political policies and whims. So many never to enjoy a early morning quiet, looking at his young children sleeping, safely in their beds. Sorry I get carried away every Memorial Day, just remembering the horrors of War and our present world of violence. I read slowly each time you post this or more information about it (such as the article when the reader located Don's Uncle's marker). It, and other articles and stories leave me in awe of our US History and what our ancestors have done. So sad our youth are (generally) ignorant of history... Thank you, again, for sharing. How can we ever be worthy of such a sacrifice? I am so glad that you post this every year. We all need to remember those who paid the ultimate price defending out Constitution and country. My uncle Bob Sanders was in that raid as a nose gunner in a B-24. They were shot down but he survived. Thank you for a wonderful tribute. Thank you. Not much more that can be said except than you.